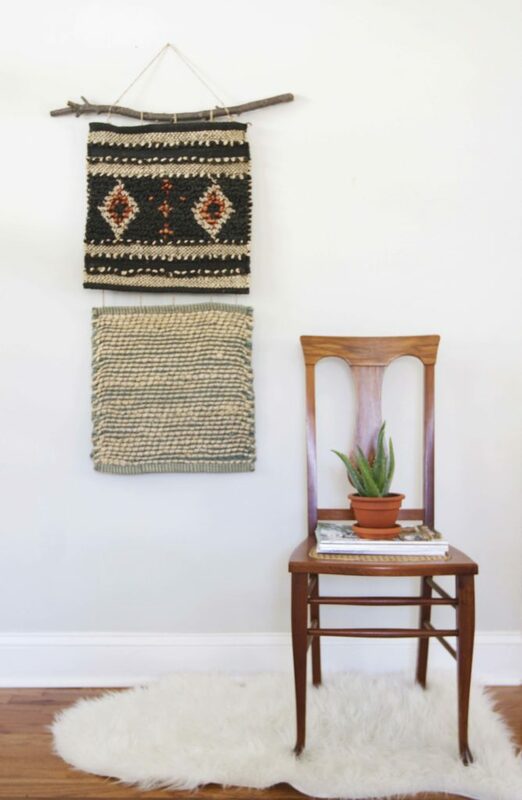 As someone who loves texture, wall hangings consistently make me swoon. I’ve wanted one of these babies since they started popping up in (what seems like) every bedroom on the planet, and I appreciate their adaptability to DIY. But….I’m also lazy. 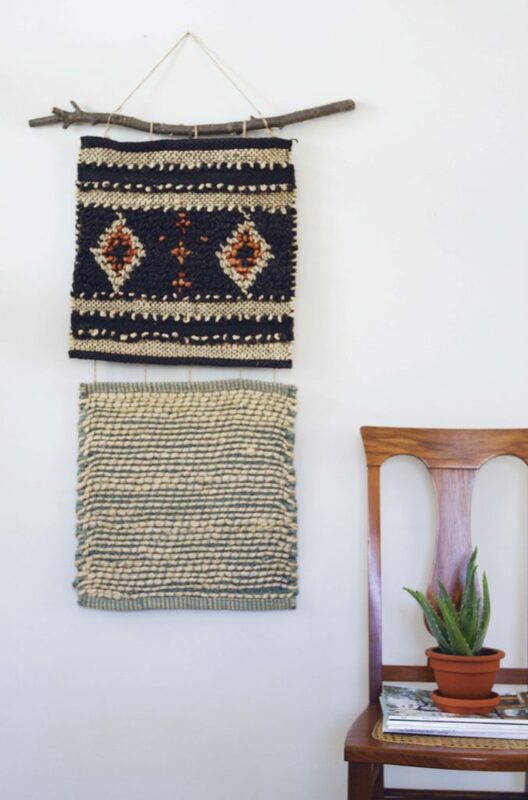 Sure, there are plenty on Etsy to buy–and so many tutorials on how to weave them. And yes, I could probably devote an afternoon to that kind of project. OR I could find a way around the prospect of building my own loom, and come up with something different. Use the twine to tie the lower-hanging rug sample to the branch, leaving enough space for the upper sample to hang, with a 2-inch gap above and below. I looped the twine through the rug’s fibers on the back, so that the knots wouldn’t show. Then tie the upper-hanging sample to the branch in the same manner. Finally, tie the twine to each end of the branch, in order for it to hang from a nail. Ta da! You’re finished. 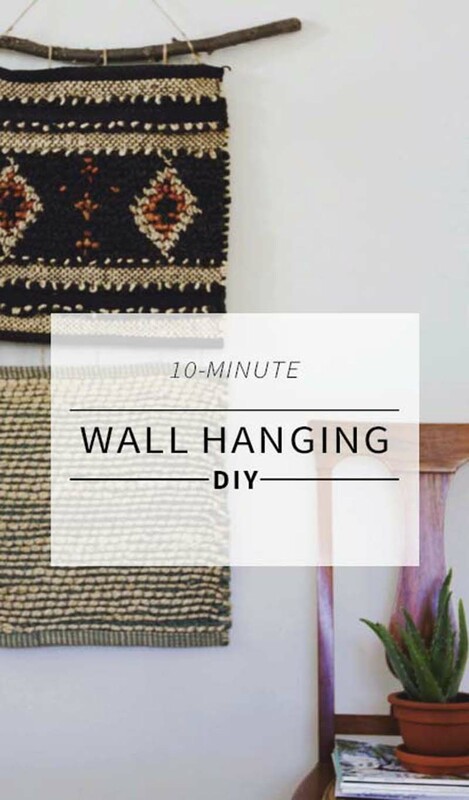 A beautiful, modern wall hanging that cost only $10 and took less than 15 minutes to make. I looked on West Elm’s website but didn’t see any rug sample? Do you have to go to one of their stores to find these? I don’t think there is one around here. Cindy, I found these at a West Elm store–I don’t believe you can purchase them online. I did a quick search on ebay for “West Elm rug sample” and a whole bunch popped up though! Try looking here: http://goo.gl/1nf79O.